Mark's out of the military, these days, with his boring, safe civilian job doing explosives consulting. But you never really get away from war. So it feels inevitable when his old army buddy Jason comes calling, with a lucrative military contract for a mining job in an obscure South-East Asian country called Quanlom. They'll have to operate under the radar—Quanlom is being torn apart by civil war, and the US military isn't strictly supposed to be there. Asaf Hanuka is a comics artist whose books have been published all over the world. With his twin brother Tomer, he created the comic Bipolar, which earned Ignatz and Eisner Award nominations. Asaf contributed art to the Oscar-nominated animated film Waltz with Bashir. The Divine is his most recent graphic novel. Tomer Hanuka is an illustrator whose work has been featured on book covers, in magazines, and in film. He has won multiple gold medals from the Society of Illustrators and the Society of Publication Designers, and his work has been showcased in Print magazine, on the cover of the New Yorker, and in American Illustration. A collection of his illustrations, titled Overkill: The Art of Tomer Hanuka, was published in 2011. 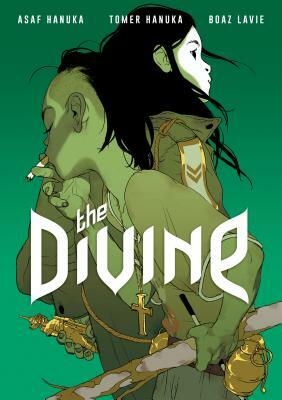 The Divine is his most recent graphic novel. Boaz Lavie is a writer, filmmaker, and game designer residing in Tel Aviv. The Lake, a short film he wrote and directed, was featured in the San Francisco International Film Festival, Slamdance, Palm Springs Film Festival, and elsewhere. The Divine is his first graphic novel.